The biggest news coming from Tuesday’s practice was that junior wide receiver James Price will miss the next six weeks with a broken left clavicle suffered in last Saturday’s scrimmage. Price’s left arm was in a sling as he watched practice in War Memorial Stadium. UW worked out in full pads. Price was listed as a starter, and was emerging as a leader among the Cowboys’ wide receivers. 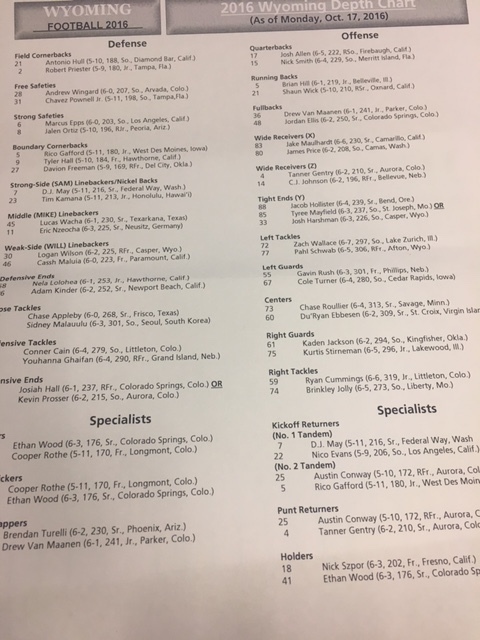 According to the depth chart UW released late Monday afternoon, sophomore John Okowli is Price’s backup. Fourth-year coach Craig Bohl said true freshman Jared Scott, at 6-6, 230 pounds, also is expected to see more playing time. Friday marked the first day the Cowboys practiced in full pads. They worked out for about 2 1/2 hours at the north 40 practice fields. Bohl also said junior quarterback Josh Allen threw threw the ball well Friday. 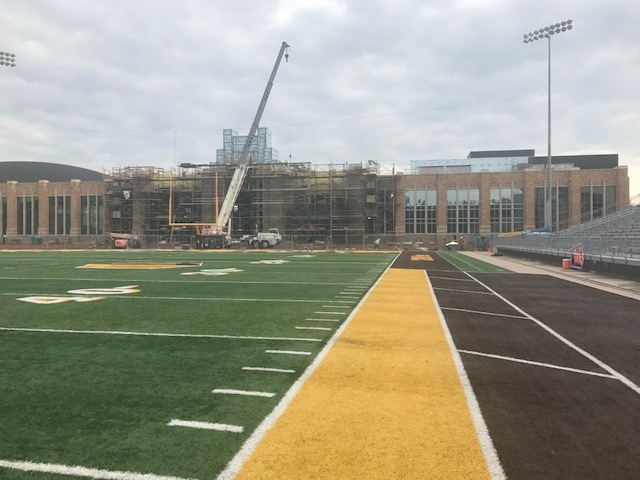 Wyoming is on its lone bye week of the season, and while it won’t be like a normal game week for the Cowboys there’s still plenty of work to be done. “We’ll be pretty much in game-week mode this entire week,” third-year coach Craig Bohl said. The Cowboys practice Tuesday through Thursday, and again on Saturday. Coaches will be on the road recruiting near the end of the week. UW’s next game is Saturday, Oct. 22 at Nevada. It was announced Monday that game will start at 8:30 p.m. MT and be televised on ESPN2. 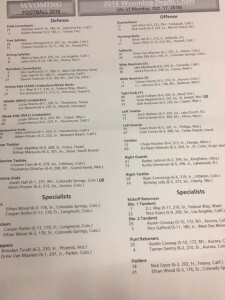 UW released a depth chart despite no game Monday. There were no changes from last week. Sophomore defensive end Carl Granderson was still listed as the starter, but UW is waiting for MRI results on his injured left knee suffered in the first quarter against Air Force. One interesting note from today: UW is one of three teams in all of the Football Bowl Subdivision that has scored at least one defensive touchdown in consecutive games this season. The others are top-ranked Alabama and No. 12 Mississippi. Alabama leads the nation with seven defensive touchdowns. It scored at least one in its first three games, and in its last two. UW and Ole Miss has done so in each of their last three games. The Cowboys’ four defensive touchdowns are tied for the second-most in the country. 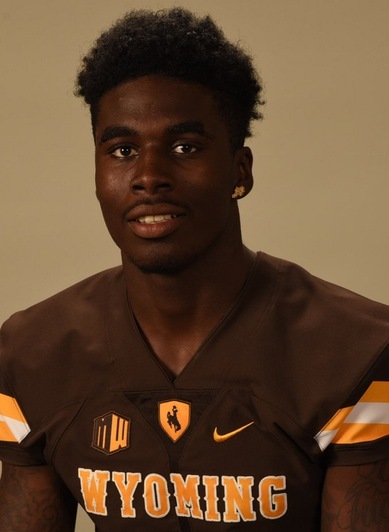 One of the more surprising aspects of Wyoming’s depth chart for its season-opener Saturday against Northern Illinois was redshirt freshman walk-on Josiah Hall as the starter ahead of sophomore Kevin Prosser. However, don’t look too much into that because both will play Saturday, and throughout the season. Hall gives UW a little more size at 237 pounds, compared to 215 for Prosser. But what’s intriguing about those two and most of UW’s defensive ends is that hardly any of them started their football careers as defensive ends. Hall and Prosser were linebackers in high school. Same can be said about UW’s other starter, sophomore Carl Granderson. The 6-foot-5, 243-pounder was an outside linebacker who didn’t play with his hand in the dirt like he does at UW. Granderson also played some at wide receiver in high school. Gordie Haug is in his first year as Wyoming’s wide receivers coach, but he is in his second year with coach Craig Bohl as the Cowboys’ director of recruiting. To date, UW has 10 verbal commitments for its 2016 class — all high school kids. The latest came Tuesday night when kicker Cooper Rothe from Longmont High in Longmont, Colorado, committed via his Twitter account. The 6-foot-, 180-pound Rothe, also plays defensive back and has four interceptions this season, and had nine last season. He is 3 of 4 on field goals this season with a long of 55. He was 4 of 8 last season with a long of 42. Rothe also was offered by Air Force. UW isn’t a program that normally gets a lot of early verbals, and 10 to this point is the most in nearly 20 years of me covering this beat. “It’s a pretty comfortable spot,” Haug said. You dont what to have too many at this point because we want those players who see themselves playing at the highest levels who may wait for offers from bigger conferences. When those offers don’t come, we’ve been there through the (recruiting process) and talking to them throughout.